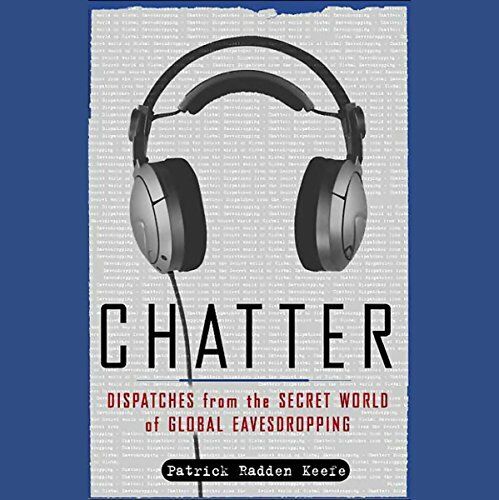 In Chatter, Patrick Radden Keefe investigates the international eavesdropping alliance known as Echelon, sorting facts from conspiracy theories to determine just how much privacy Americans unknowingly sacrifice in the name of greater security. Keefe's riveting investigation moves from a secret listening station in England's Yorkshire moors to the intelligence bureaucracies of Washington and London; from an abandoned National Security Agency base hidden in the mountains of North Carolina to the European Parliament in Brussels. Along the way Keefe meets intelligence eavesdroppers who listen in on other people's private conversations, protestors who believe that systems like Echelon will end privacy as we know it, former senators who feel American intelligence operates without any effective legislative oversight, and the journalists who brought Echelon to light. As the struggle between national security and civil liberties becomes ever more pronounced against a backdrop of global terrorism, Chatter is sure to fire debate. Listen to an interviewwith Patrick Radden Keefe on Fresh Air. ©2005 Patrick Radden Keefe (P)2005 Books on Tape, Inc. It's a shame this book hasn't been more widely listened to (only 3 ratings at time of this writing, all 5 stars) because it's extremely informative and brings to light issues/events that you might not be aware of, or even think of when you consider the topic of intelligence. It's an ideal book for anyone curious about the subject, and if you're interested in learning a little from a neat non-fiction book, this one is a great choice. Just listen to the audio sample first, the narrator's voice is quite deep and maybe a little exaggerated. My mp3 player lets me select a higher playback speed so I can make the voice sound more normal and it's not a problem for me. I still highly recommend it regardless. This is a really solid introduction to a topic I knew almost nothing about. If you want to learn something substantive about Signals Intelligence (electronic evesdropping) in an utterly painless way, this is a great download. It's pretty well-written, and although it meanders about at times, by the time it's all done, you've had a very broad exposure to the topic. The author here is not some privacy zealot out to do a hatchet job on the NSA. Rather, he seems to approach his topic with a genuine sense of intellectual curiousity and an understanding of the inherent trade-offs between privacy and security interests. But what emerges from this fair and frank analysis of the available information is no less troubling. If you are concerned about your personal privacy, this book shows you have every reason to be justified in those concerns. If you aren't particularly concerned about privacy and just hope our spys manage to find a way to stay ahead of the bad guys and head off the next 9/11, you should also be very concerned about what this book has to say about the effectiveness of U.S. evesdropping capabilities. The picture that emerges here is that of a traditional, hide-bound government bureaucracy, unable to adapt to the changes in modern communication, rather than the all-seeing, all powerful, Great Eye of the U.S. that some would have us fear. Yet at the same time, this very bureaucracy is almost completely shielded by secrecy, and still possesses incredible power to invade our privacy, both at home and overseas. We may have the worst of all possible worlds: an ineffective NSA that often can't actually find the bad guys, spends billions of our dollars, possesses powerful tools for the invasion of our privacy, and has been basically left to its own devices. The book not only shows you these problems, it also gives you enough exposure to the field to understand why they all are going to be very difficult to solve. The book does an okay job discussing some of the world of SIGINT. The book doesn't progress to solid conclusions, but as previous reviewer said, tends to jump around. As a former SIGINT worker, I think that the book best details the goverments over reliance on technical intelligence as well as indirectly exposes the results of the brain drain of the 80's from the agencies as we left to join the "gold rush" of technology start-ups. The best parts for me are the discussion of how public technologies have caught and surpassed NSA capabilities. There are some interesting character analysis of people who do this work. As a former traffic and crypto-analyst, I have to agree with the section on how we perceive ourselves, relative to the others within the intelligence community. The narrator could have read a bit faster, but did a great job nonetheless. Incredible story for those that have 'heard things' about Echelon and it's capabilities, and have fears built falsely on the listening capabilities of our government, this book helps to define many of the things they can and can't do, but also may be able to do. Terrific book! If you are at all interested in technology or intelligence, this is definitely the book for you. I figured it was going to be a retelling of everything that we already hear on the news and the internet. However, I learned a lot of things that I didn't even fathem existed. The only reason that I gave the book a 4 out of 5 is that Keefe left me with an urge for more at the end. This was done intentionally as he admits that his book is not the "final word" on the matter, but "the first." I highly recommend it to everyone. It kept me glued to my iPod for hours per day. One of the delights of this audiobook is the clever and deft writing. For a guy who claims he is not an investigative reporter, he sure fooled me. This audiobook is full of "Really!" moments--and it does offer a good, critical evaluation of claims, counterclaims and explanations about intelligence gathering. The narration is wonderful and even those reasonably familiar with Elint and Sigint will find a LOT here of value. You'll be recommending this audiobook to friends! Highly overrated by prior reviewers in my mind. There are some interesting tidbits, but jumps around a lot, not really a cohesive story. I really do not need a list of listening posts around the world. The fact that the government is listening where it can is not surprising. Chatter sheds light on many failures of the intelligence community and specifically the NSA. However, the author, fails to understand and deliver the reasons "why?". His left leaning rhetoric gets in the way of what could have been a well written evaluation of the NSA and SIGINT at large. One example, author complains about polygraph examiners instead of linguists being hired after 9/11, without understanding how the linguist needs were being met by the NSA and the agency's need for examiners instead of more linguists. Chatter maybe worth buying 75% off from the deeply discounted shelves outside Barnes and Nobles. Otherwise save your Audible credit, and read the book's mediocre highlights online. So many different angles and elements- could be a thriller- but rings with expertise, facts, and keeps ones interest after the book is done! Sobering! Fascinating look into how the government spies on everyone. Gives a historical good overview of eavesdropping by the NSA, and other agencies. Also discusses the ethics of eavesdropping and the debates by leaders on this issues. Very good read. Try it!